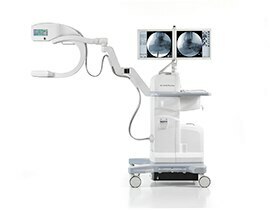 General HD imaging profile enhances visualization during catheter insertion procedures. 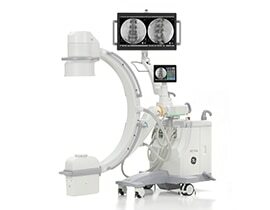 The General HD profile softens bones and dense tissue on an X-ray while enhancing visualization of devices, so clinicians can more easily see catheter insertions during procedures like PICC (peripherally inserted central catheters), Port Access, Central Venous Access, and Dialysis catheters. 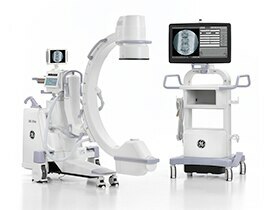 Motorized Drive options for intuitive memory positions including last shot, table side controls, and choice of Super C configurations for cardiac and vascular procedures. With advanced technology, intelligent workflow, and dose control, the OEC Elite CFD is the future of mobile surgical imaging. 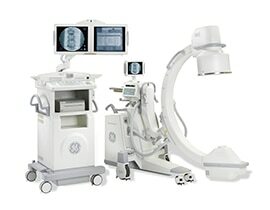 Choose between three C-arm models, Ergo-C, Super-C, and Super-C Motorized to complement your surgical needs. This system is ideally suited for a range of surgical needs including vascular, cardiac, orthopedics, gastrointestinal, endoscopic, urologic, critical care, pain management and emergency procedures. CFD CMOS Flat Detector—a more efficient panel that delivers better image quality at low dose.